Feel Right at Home. From palatial estates to city apartments, residential architects and designers specify materials from Panolam™ Surface Systems. Panolam® offers the widest selection, quality and style to match any taste and budget. 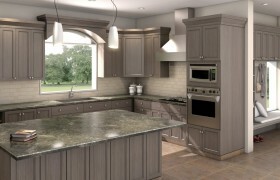 Check out our impressive array of solid colors and our incredibly realistic wood grains and patterns. You’ll be amazed how our surfaces can transform the feeling of a kitchen or bathroom.